January 18, 2018 – In a clear sign of continuing long-term climate change caused by increasing atmospheric concentrations of greenhouse gases, 2015, 2016 and 2017 have been confirmed as the three warmest years on record. 2016 still holds the global record, whilst 2017 was the warmest year without an El Niño, which can boost global annual temperatures. A consolidated analysis by the World Meteorological Organization of five leading international datasets showed that the global average surface temperature in 2017 was approximately 1.1° Celsius above the pre-industrial era. The year 2016 remains the warmest year on record (1.2°C above preindustrial era). 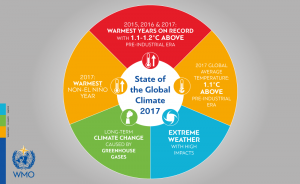 Global average temperatures in 2017 and 2015 were both 1.1°C above pre-industrial levels. The two years are virtually indistinguishable because the difference is less than one hundredth of a degree, which is less than the statistical margin of error. 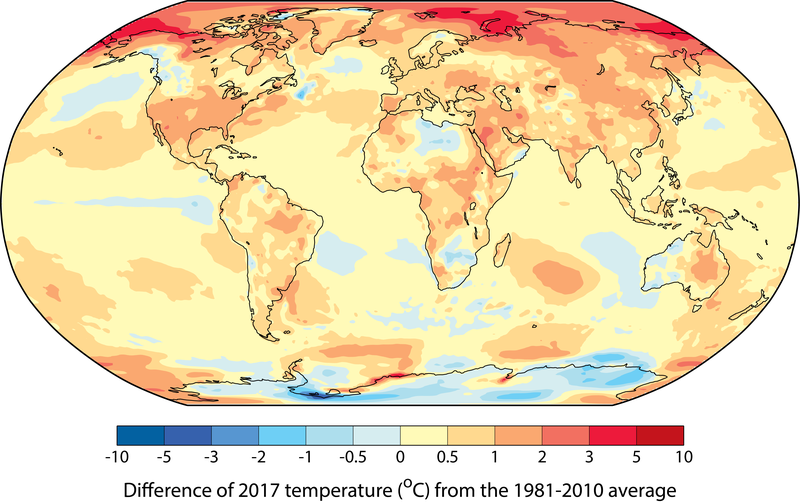 The globally averaged temperature in 2017 was about 0.46°C above the 1981-2010 long-term average (14.3°C). This 30-year baseline is used by national meteorological and hydrological services to assess the averages and variability of key climate parameters, such as temperature, precipitation and wind, which are important for climate sensitive sectors such as water management, energy, agriculture and health. In addition to the global warming due to rising greenhouse gas levels in the atmosphere, the climate also has a naturally occurring variability due to phenomena such as El Niño, which has a warming influence, and La Niña, which has a cooling influence. The strong 2015/2016 El Niño contributed to the record temperature in 2016. By contrast, 2017 started with a very weak La Niña and also finished with a weak La Niña. “Temperatures tell only a small part of the story. The warmth in 2017 was accompanied by extreme weather in many countries around the world. The United States of America had its most expensive year ever in terms of weather and climate disasters, whilst other countries saw their development slowed or reversed by tropical cyclones, floods and drought,” said Mr Taalas. WMO will issue its full Statement on the State of the Climate in 2017 in March. This report will provide a comprehensive overview of temperature variability and trends, high-impact events, and long-term indicators of climate change such as increasing carbon dioxide concentrations, Arctic and Antarctic sea ice, sea level rise and ocean acidification. The final statement will include information submitted by a wide range of United Nations agencies on human, socio-economic and environmental impacts as part of a drive to provide a more comprehensive, United Nations-wide policy brief for decision makers on the interplay between weather, climate and water and the United Nations global development goals. The three conventional surface temperature data sets are NOAA’s NOAAGlobalTemp data set, Met Office Hadley Centre and Climatic Research Unit HadCRUT.4.6.0.0 data set and NASA GISS’s GISTEMP data set. They use measurements of air temperature over land and sea-water temperature measurements over oceans to estimate temperature anomalies around the globe. The reanalyses are the ERA-Interim of the European Centre for Medium Weather Forecasts and the JRA-55 of the Japan Meteorological Agency. Despite the very different approach, the estimates of global average temperatures produced by these reanalyses are in good agreement with the conventional surface temperature datasets. 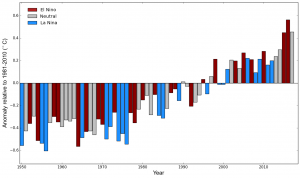 WMO now uses 1981-2010 as a baseline for computing Temperature variations at monthly, seasonal and annual time-scales. This replaces the 1961-1990 baseline used previously. The 1981-2010 period is also recommended by WMO to compute the climatological standard normal for operational climate monitoring as it is more representative of current climatic conditions. It allows a consistent reporting of information from satellite and reanalysis systems, some of which do not extend back to 1960, alongside with traditional data sets based on surface-based-observations managed by the National Meteorological and Hydrological Services of the 191 WMO Member States and territories. For global average temperatures, the 1981-2010 period is approximately 0.31±0.02°C warmer than that of 1961-1990. The change in the baselines has no influence on trend analysis. WMO uses the period 1880-1900 as a reference period for pre-industrial conditions allowing early instrumental observations to be used for estimating pre-industrial temperature conditions.